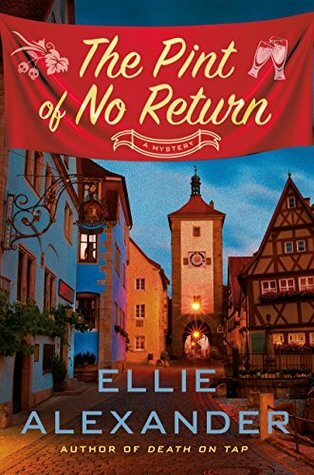 I only recently discovered Ellie Alexander when I read the first Sloan Krause mystery last year. Since then I have read one of her Bake Shop Mysteries and I absolutely adore her mysteries. There is nothing like mixing food (especially pastries!) with murder. Being from Oregon myself, I have a soft spot for all things Pacific Northwest as well as local authors. I got in on the Sloan Krause series from the very beginning and I was thrilled to be asked to read the next book! One of the things that drew me to this series was the small town of Leavenworth in Washington. That little town is famous in the Pac NW for its Christmas activities…..it’s basically a small German winter wonderland. I really only thing of Christmas when I hear about this town, but Oktoberfest makes sense too. We have a large German population in Mt Angel who is also famous in Oregon for their Oktoberfest so it makes sense that this book would feature that lovely festival devoted to beer and sausage. Unlike the Bake Shop Mysteries that Alexander first started writing, this one revolves around beer. So many cozy novels focus on baking or cooking but this one sets itself apart with beer and I am totally ok with that. Alexander writes with a practiced hand and crafts a novel that is not only easy to follow but keeps readers engaged and moving at a moderate pace. It’s not so fast that readers are racing toward the end, but it’s not a slow burn either. It’s perfectly balanced, just like the beers! I love Sloan as a protagonist. In the first book I felt like she had an edge to her that made he not quite fit in with the other characters or townspeople, but yet she wasn’t a completely odd duck. In this book she still has the same edge but yet is coming into her own and trying to sort out her life and what she’s going to do once her divorce is final. She’s easy to like and I enjoyed her just as much this time around as I did before. This book is packed full of details. Alexander does an excellent job describing the town and the festivities as well as the whole beer culture. Sometimes the details about beer and the beer industry seemed to be a little much, and I remember thinking the same thing in the first book. It was interesting to a certain degree, but then if you aren’t really into beer, then you will probably feel a little bored with the additional details. I felt like it was ok, but then again I like beer and here in the Pac NW, the craft beer industry is big so I didn’t mind it too much. I loved the mystery itself. Again Alexander’s experience shines in this new series. She knows how to leave enough bread crumbs for readers to follow and she lets the reader investigate along with the protagonist. This was a fun one to read and it went fairly quick. It makes an excellent fall read as it’s harvest time and beer festival time here in Oregon so this book held a special place in my heart for that.